Frameworth has partnered with the St. Louis Blues to bring to life three exclusive collectibles only available to St. Louis Blues' season ticket holders. 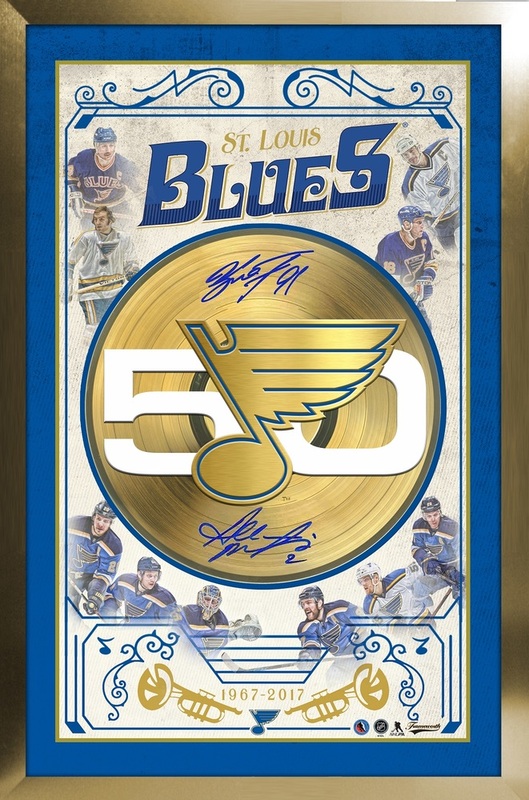 This frame features a gold record symbolizing the history of the teams logo that comes personally autographed by Al MacInnis and Vladimir Tarasenko. The record comes professionally framed alongside an NHL licensed collage of some of the best St. Louis Blues players in the history of the organization. The dates 1967-2017 are written at the bottom of the frame dictating the franchises existence. The frame is finished in a luxurious gold frame with royal blue matting. The frame comes with a certificate of authenticity guaranteed by the St. Louis Blues. Finished Size: 30x21"
Frameworth ships your order within Canada and the United States to the address of your choice, however we do not ship internationally. Orders will be administered within 1-2 business days and will typically ship within 4 business days of being processed. Winners are Responsible for tariffs, taxes, duties and any other additional costs associated with shipping within North America. Additional Charges may apply for remote areas. Frameworth also offers the option of pick-up, which can be done at our location in Toronto. Please allow 4 business days for a pick-up request to be processed, where a Frameworth representative will contact you to let you know your auction win is ready to be picked up. If the auction win is not picked up within 10 business days of a Frameworth rep contacting the customer, Frameworth Sports Marketing reserves the right to cancel & refund the order in full. Frameworth does not ship to PO Boxes. If the address you have registered in the system is a PO Box, please email us at auction@frameworth.com to provide a new shipping location. If we are not provided with an alternate address after 72 hours after a customer is contacted by a Frameworth representative, the customer will be charged with a 20% restocking fee and the order will be cancelled. We recommend providing an email address in the NHL auctions system so that we can provide every customer with their shipment's tracking information and follow your package to your doorstop. If a package is sent back to Frameworth because of an unreliable shipping address, the customer must pay the re-shipping charges, or else the order will be cancelled an a 20% restocking fee will be applied. When will my shipment arrive? Does my address fall under the standard shipping rates? How does tracking information work? What category does my product fall under for shipping rates? We do not allow returns once an auction has closed. Seller reserves the right to cancel the auction at any time. For items being shipped to the USA or Internationally, no taxes will be charged. Winners are responsible for tariffs, taxes, duties and any other additional costs associated with shipping to your location.